Bhiksuni Zhijue was born as He Qinghua in July 1969 in the capital city of Ningxia Province, Yinchuan, China. Her father was a worker & her mother a teacher. She has two older brothers & two older sisters. Her childhood was full of happiness, joy, harmony & she was cherished by her family from the day she was born. She completed elementary education at the Organizational Primary School of Shizuishan City, Ningxia in 1982 & successfully enrolled in the top class of the lead middle school of the city. Bhiksuni Zhijue received the title of excellent student of the city in 1983 & often took part in tests on math, debate, sports & received many rewards at that time. Her studies were excellent & she performed exceptionally well in physics & debating. In 1988 she finished high school at Mining Bureau High School in Shizuishan City. The first test of the National College Entrance Examination (NCEE) that she took was Chinese language. Unfortunately, just forty minutes after the test started, she suffered from diarrhoea & submitted her paper. She lacked experience with such examinations & she was afraid to tell the examiners. This was the first test which defeated her in life. The failure shook & impacted her life greatly. She then calmly considered the meaning of life, the value of life, as well as, her aim in life. Up until that point in life she had been very successful, ambitious & had desired to be elite, unlike her classmates who just wanted to find a job & marry as quickly as possible. She pondered hard & looked for a way to actualize the value of her life. One day, Bhiksuni Zhijue road on a bicycle to Beita Temple in Yinchuan for no reason; perhaps it was because a good seed had germinated & her connection with Buddhism had ripened. Regardless, an old monk there gave her a circle of prayer beads & a book named Introducing Buddhism to Intellects. She read that book carefully. She felt as though reading that book was better than ten years’ of higher education & she started to awaken to new truths. She had found what she was looking for. What she wanted to pursue was in Buddhism! She would pursue the truth, and save sentient beings, as well as, attain Buddhahood! She decided, with a firm mind, to leave her family & looked for a place where she could practice when she was nineteen. Unfortunately, Bhiksuni Zhijue’s parents firmly refused her request. However, her will was as strong as stone & her parents had to let her go. Bhiksuni Zhijue went to Zhaojue Temple in Chengdu & paid a visit to Venerable Bhikkhu Qing Ding. When she saw the master for the first time, he told her, “You have a very good root. Practice hard & try to attain enlightenment during this lifetime!” She admired the master’s compassion, virtue, the pure precepts he kept, & the achievements of his practice. As lay practitioner, she followed the master a few years until he ordained her compassionately in 1994. The master was ninety three years old at that time & she was twenty five. 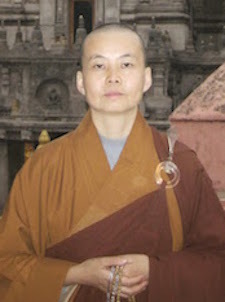 In 1996 Bhiksuni Zhijue completed her undergraduate studies from the Buddhist Academy of Minnan. Bhiksuni Zhijue’s dissertation was published in the Academic Papers of the Academy. Since 1998 Bhiksuni Zhijue has taught at the Buddhist Bhiksuni’s College in Guangdong. Till now, she has taught nuns the Shurangama Sutra for sixteen years. In class, Bhiksuni Zhijue preaches the profound knowledge of the attainment of Buddhahood through the state of deep meditation of Shurangama in a simple & harmonious way, using metaphors & cases, as well as, combining theories & concrete practice. This method of teaching fills students with Dharma joy. They gain great benefit & they are all fond of the teaching. Many Bhiksunis from all over China want to join the college in order to follow her teaching on the Shurangama Sutra. One student was even quite ill, & she attended the class while taking intravenous infusion! Bhiksuni Zhijue dedicates herself to Buddhism education silently. Over the last sixteen years, in order to educate Buddhist nuns, she has accepted responsibility as a teacher without any grudge or complaint. Because teaching & studying benefit each other, & Bhiksuni Zhijue has been blessed by the power of the Triple Gems, her ability in debate & wisdom has consequently grown. She integrates the theory of Buddhism gradually through comprehensive teaching & study & understands the deepest knowledge of Dharma clearly in her mind. Although she has not attained enlightenment, she can understand & explain it, and has gained the power to teach beings. Therefore, she is able to carry out the activity of a Bodhisattva & benefit beings. After sixteen years of research, teaching & writing, her book of Interpretation of the Shurangama Sutra which is three-hundred & fifty thousand words long was published by Faming Poshashan Publishing House, Taiwan in 2005. This book became one in the collection of the Compassion & Dharma Treasure. Many Buddhist academies, training classes & Dharma centers asked to get copies. Therefore, no more than one year after the book was published, all copies were sold out. In 2007, the Editorial Department of the Buddhism in Guangdong printed five thousand more copies. After a couple of years’ circulation, there are now only a few copies left. This year, her Detailed Interpretation of the Shurangama Sutra was published by Shanghai Classics Publishing House. Also, some short works of hers were published by magazines & journals, such as Buddhism in Guangdong, Pure Land, The Group of the Enlightened, Clear Clouds and Dharma Rain, & Buddhism of Foshan. In both 2008 and 2012, Bhiksuni Zhijue ranked the first among all competitors that joined the test of Dharma teaching & debate. Bhiksuni Zhijue also ranked No.1, juxtaposed with another competitor in the national test of Chinese Buddhism & received the first class Golden Lotus medal. published Interpretation of the Shurangama Sutra (350,000 words) Faming Poshashan Publishing House, Taiwan. The book became one in the collection of the Compassion & Dharma Treasure. Led a group of excellent young & middle-aged Buddhist masters to disseminate Buddhism in Hebei, Liaoning, Jilin & Heilongjiang provinces. Her preaching of Dharma made deep impressions on audiences & the ceaseless applause made a deep impression on her in return. Employed as a Professor in the Department of Religion of Zhejiang University. Joined the Chinese Buddhist Association’s 50th Anniversary Ceremony in New York. Preached the stages of Buddhist vows & activities & her preaching was well acknowledged by the audience. Published the Detailed Interpretation of the Shurangama Sutra, Shanghai Classics Publishing House. Some short works were published by magazines & journals such as Buddhism in Foshan, The Group of the Enlightened, Clear Clouds and Dharma Rain.